Buying a commercial mixer is a big decision, not just for the money you are likely to pay, but also because of the uses you might have planned for it. There are several considerations that should always be taken into account, not the least of which is the reason you are actually researching mixers and the intended use. This buying guide will take you through some of the items worth considering before you head out to purchase the first mixer that catches your eye. These mixers can mix, chop and blend and are perfect for processing large amounts on a daily basis. The mixing bowl remains in a fixed position while the beater moves via an offset shaft, resulting in the name ‘planetary’ – as in planets rotating around the sun. These mixers can be used for smaller quantities by using a smaller bowl. While they are known for their versatility, precision is not a strong point. They can also handle a variety of attachments such as a vegetable slicer, grater/shredder and a meat chopper/grinder. ​This type of mixer is ideal for mixing large amounts of dough in a batch and features a fixed spiral beater, around which the bowl rotates. 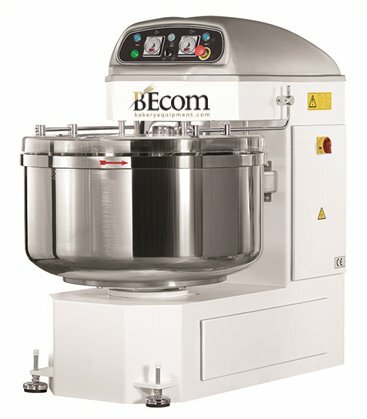 It can mix large volumes of dough and is generally more precise than the planetary mixer and doesn’t require bowl changes for smaller batches. It also doesn’t have the capacity for the attachments which can be used with a planetary mixer. Vertical cutter mixers are industrial-sized versions of a food processor. These mixers can be used for kneading, chopping, blending, emulsifying and of course, mixing. Although the vertical cutter is very versatile it has some disadvantages, it can be very loud and somewhat difficult to clean. Most people agree that it doesn't produce as good a dough as a planetary or spiral mixer. The thing that determines the size of the mixer is the bowl and there are numerous considerations to be made when deciding on the bowl size and there are three types of mixers related to bowl size. Bench mixers will accommodate 10 – 24 quarts and while significantly larger than a countertop mixer, is still able to sit on a strong, stable work surface, such as a work table. Floor mixers are the largest and most common commercial mixers and have a 30-80 quart capacity. As the name suggests, they sit on the floor. This is an important consideration when deciding on what size mixer to purchase and the reason for this is because of ingredient expansion during the mixing process. If the bowl size is too small to accommodate ingredient expansion, the result will be an overflow. You will need to calculate the absorption ratio by dividing water weight by the flour rate. Batch size can be influenced by flour protein content, water temperature, amount of water and oil in the dough. Additionally, capacity should also be considered from a business perspective. Your business will likely grow and a smaller capacity mixer will need to work harder to meet future demand, possibly damaging the motor in the process when it has to work harder than it was meant to. This is directly related to capacity and the rule of thumb is to calculate the absorption rate before buying the mixer. If the absorption rate is low, the dough will be stiff to mix and a more powerful mixer will work best without straining the motor. It may be necessary for you to purchase more than one mixer depending on what you will be mixing. While this might seem initially more expensive, long term planning will save you money by not burning out the motor of a smaller than required mixer. Quantities and the purpose of your business are closely related. A bakery or pizza business is likely to need a large capacity mixer while a small restaurant will not. Looking carefully at the tasks the mixer will need to perform is essential if you want to find best value for money. For example, the small restaurant will benefit from a 5 – 20 quart planetary mixer because of the versatility to be found with the extra attachments. A bakery on the other had would benefit from a large capacity spiral mixer, possibly a floor mixer. Bowl scraper – does exactly as the name suggests and scrapes down the sides of the bowl while the agitator turns. It will save time by not having to do the task manually – wasting ingredients not being conducive to good business management. Mixer table is not a standard attachment, but can provide stability for countertop mixers. They are available with castors so you can move your mixer around to suit the task at hand. In the interests of obtaining peak performance from your mixer, you should become familiar with how your mixer performs at various speeds for various tasks. The mixer manual should outline these for you. One of the most important considerations regarding mixer speeds is whether or not you can change the speed while the mixer is operating. It will save you time if you don’t need to stop and start every time you need to change speed. Before purchase your mixer you should find out if your mixer of choice is equipped to do this, or if the unit required to be shut down every time to prevent motor damage. The other thing worth investigating before purchase is the way in which your mixer’s bowl attaches and detaches from the mixer. The choices are electric and manual and you should decide which is going to be the best fit for your requirements. Manual Bowl Lift – is as the name suggests and either the bowl or the mixer head can be raised by way of a lever or a wheel. Planetary mixers typically have the tilt head feature. Electric Bowl Lift – this is an automatic process undertaken by pressing a button or some type of electronic interface. It is commonly used for large mixers that typically have large mixer bowls. This is important to ensure longevity of your mixer. It goes hand in hand with selecting a mixer of the correct capacity for the usage you intend for it. You should never overload your mixer if you expect it to last you a long time. A small bargain mixer will not be a bargain if it burns out and requires replacing due to your usage not being fit for purpose. Your mixer can do a lot of work for you so it makes sense to look after it and not overload it. Every time you use the mixer you need to thoroughly clean the mixer bowl, shaft and any attachments you used during the process. Other parts of the mixer should be cleaned regularly, once per week for example. It’s best to use soapy water along with a brush or soft rag. TIP: don’t use anything abrasive for cleaning if you want you mixer to look good for a long time. Moving parts on the mixer need to be lubricated on a regular basis and you will need to consult the mixer manual for your particular mixer to determine how often, as well as where to locate the parts that require lubrication. It is essential to use food grade lubricant, especially the mixer shaft as it will likely come into contact with your food product. As you can see, there are a multitude of considerations to ponder before purchasing a commercial mixer. Hopefully this guide has laid out the groundwork to guide you through the items that are likely to be the most important so you are able to purchase your mixer with confidence, knowing it will perform as expected and do the tasks you require for your business.